A poignant and funny look at generations of folks whose lives made stops or overlapped in an opulent dining room. The actors (a fine ensemble of Heidi Armbruster, Chris Henry Coffey, Jake Robards, Charles Socarides and Jennifer Van Dyck) play various owners and servants in the home over the years, often portraying the same characters at different ages (including juveniles). It's a look back at different times and a sobering realization that some things don't change. 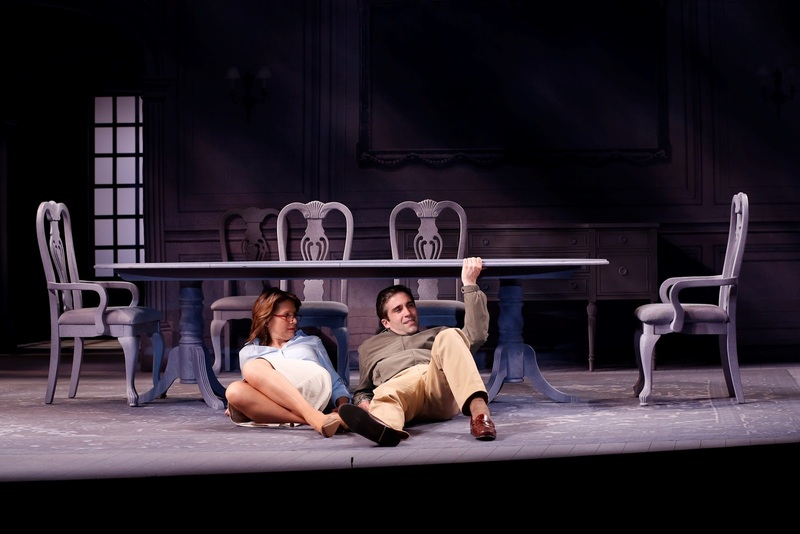 Director Mark Lamos coaxes compelling performances from the ensemble and maintains a brisk pace which keeps the quiet piece (less laugh-out-loud than some of Gurney's other works) from inducing yawns (which this play can trigger i the wrong hands). 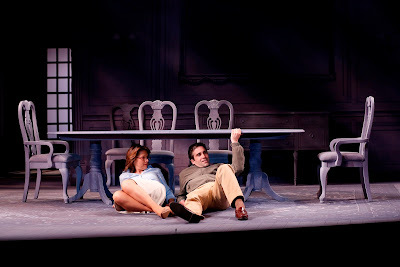 Scenic Director Michael Yeargan paints everything in a blue gray color -- the walls, furniture, floors and all -- in a stroke of genius that allows the lives of the room' inhabitants to be the real color the house offers. A tad confusing from time to time to figure out who's who and what year we're in, but not enough to throw us off for long. This is the season opener (the 83rd) for Westport Country Playhouse. An extra performance has been added on Sunday, May 19, at 3 pm Performances are Tuesday at 8 pm, Wednesday at 2 and 8 pm, Thursday and Friday at 8 pm, Saturday at 3 and 8 pm and Sunday at 3. Ticket prices start at $30: (203) 227-4177,1-888-927-7529, Westport Country Playhouse, 25 Powers Court, off Route 1, Westport, www.westportplayhouse.org.